Building off the successful franchise, the shameless bunch from the Outlaw series returns to the repressed world of golf with their outrageously twisted antics. Scantily clad babes and deviant thugs take to the course and give a whole new meaning to playing from the rough. 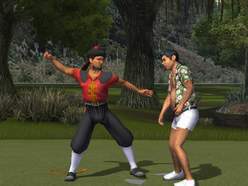 Anyone and everyone can grab some balls and spin, hook and slice their way into the action online, where a state-of-the-art golf engine and 10 over-the-top playable characters turn boring old golf into a rowdy and tasteless display of uninhibited fun. Features include a new fighting system that lets you beat up your caddie to increase composure, as well as a new cart driving system that lets you perform cart tricks like donuts, jumps, and slides. No other Golf Game packs this kind of punch! Great soccer players need a great first touchâ€”and the same is now true for gamers with FIFA Soccer 2005. Using an all-new fluid player kinetic system, a playerâ€™s first touch becomes a key advantag..